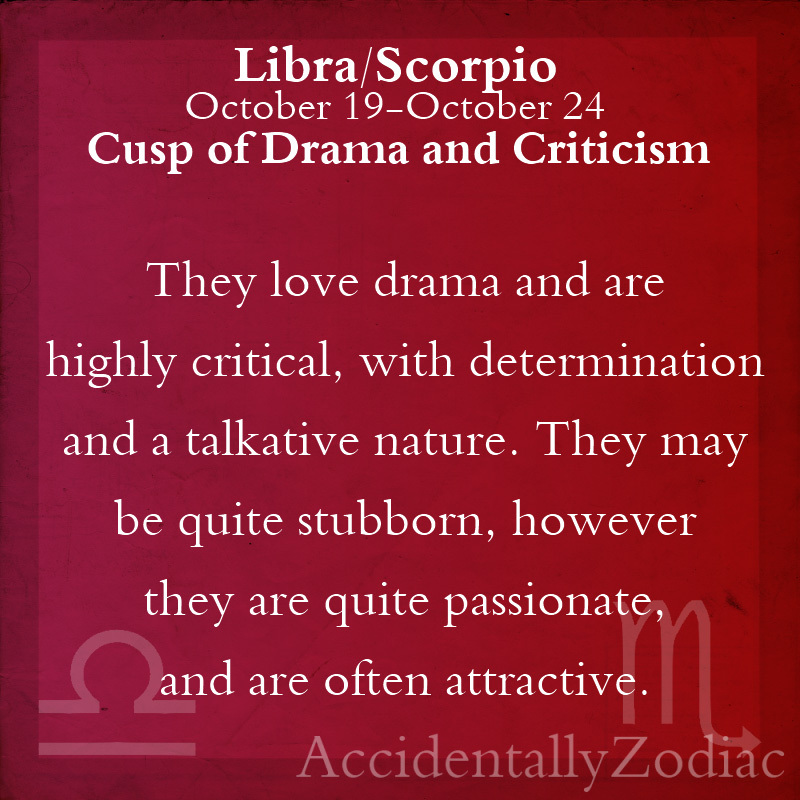 They love drama and are highly critical, with determination and a talkative nature. 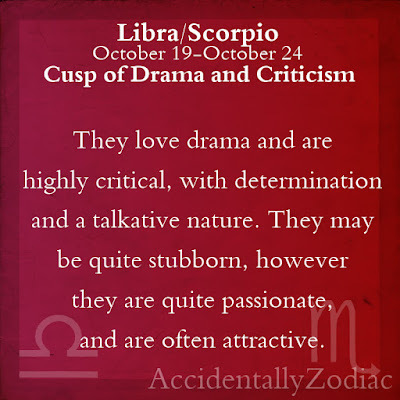 They may be quite stubborn, however they are quite passionate, and are often attractive. 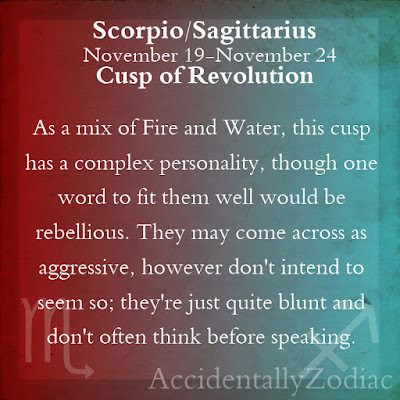 As a mix of fire and water, this cusp has a complex personality, though one word to fit them well would be rebellious. They may come across as aggressive, however don't intend to seem so; they're just quite blunt and don't often think before speaking. 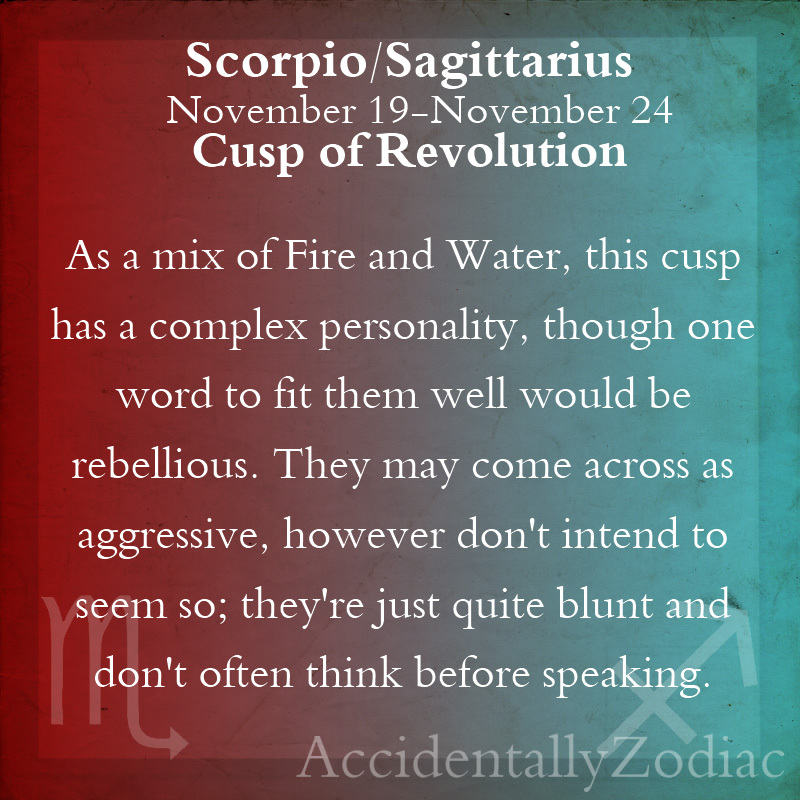 Individuals born on the Scorpio-Sagittarius cusp like to rebel against authority. Ironically, some will find themselves in positions of authority in later life, and they will use their authority with skill. They fare very well when they own their own business. If they work for others, they do best when they are allowed to work on their own. They love competitions of all kinds, especially those that pit them against one other person. They may enjoy gambling and seem to know Lady Luck personally. They enjoy debate and drama. 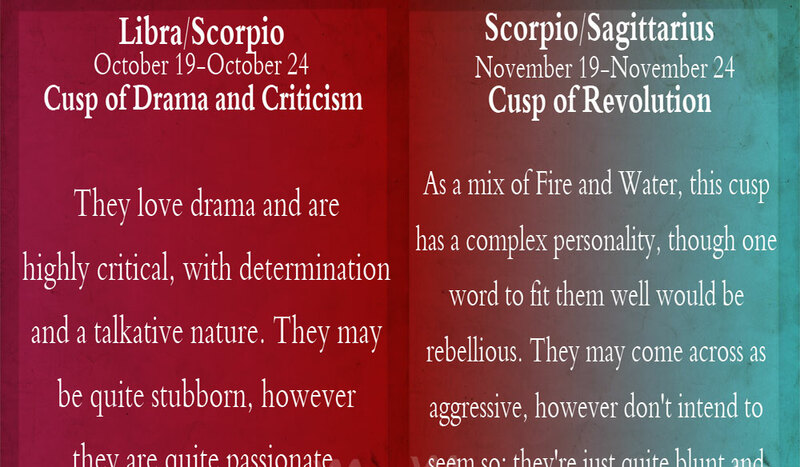 In relationships, Scorpio-Sagittarius is playful, caring and may become possessive. They don't allow boredom to affect their projects, and they truly want to see every project through to the end. 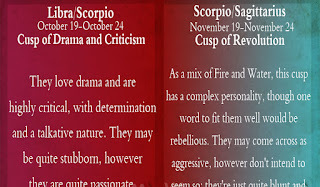 Those born on the Scorpio-Sagittarius cusp learn quickly and well. They are fearless. It is very difficult for them to wait passively. They may be annoyingly pessimistic. They appreciate it when they receive praise for a job well done. They may have an incredible academic mind, and would make a good teacher, researcher or consultant. They may also excel at writing or publishing. They are adventurous and courageous, so travel intrigues them. They may also show interest in the occult and other similar subjects. They are very sensitive, but they don't like to show their vulnerability.